Editor's note: There are two photos and a video associated with this release. 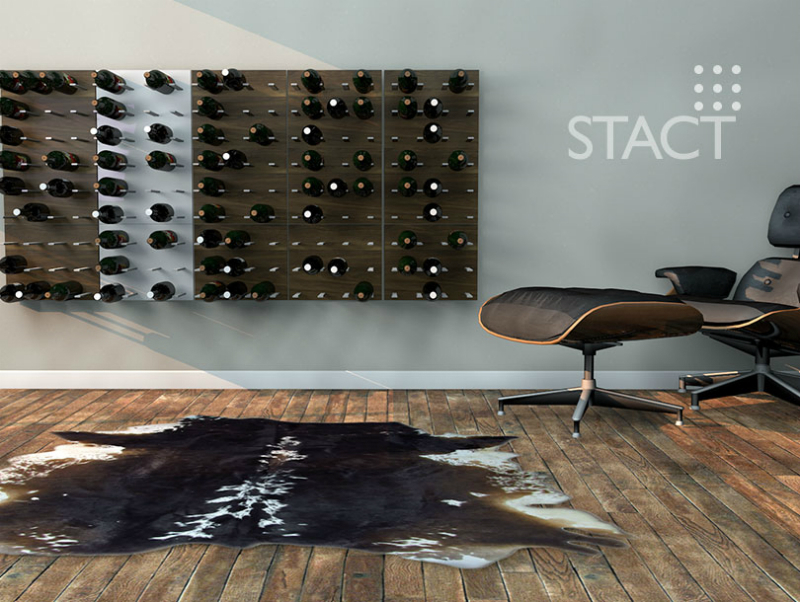 STACT, a Canadian-based startup creating design-savvy solutions for customers, is pleased to announce the launch of its first product, the STACT modular wine wall system. Founded in Vancouver, BC and designed by 2012 ICFF award-winning product designer, Eric Pfeiffer, the STACT modular wine wall display is available globally for pre-order beginning July 26, 2012 through Kickstarter and getSTACT.com. "In a world of boring, traditional and downright tacky wine storage solutions, the STACT modular wine wall system sets a new standard for simplicity, usability, and style," said Jamie Kasza, Founder and Principal, STACT. "The design of our first product was brought to life by celebrated designer Eric Pfeiffer. We're confident customers will find STACT a revolution in modularity and versatility when it comes to showcasing their wine collection." With a modern aesthetic in mind, STACT is crafted from high quality aircraft-grade aluminum and premium wood veneers, featuring a high-end appeal previously found only in modern wine cellars, avant-garde restaurants and wine bars. The patent-pending design is uniquely versatile and space efficient, customizable and expandable to fit any space. Available in six stunning finishes, it seamlessly integrates with any décor. "I welcomed the opportunity to design a thoughtful and useful solution to wine storage, using quality materials missing in today's market," said Eric Pfeiffer, president of Pfeiffer Lab. 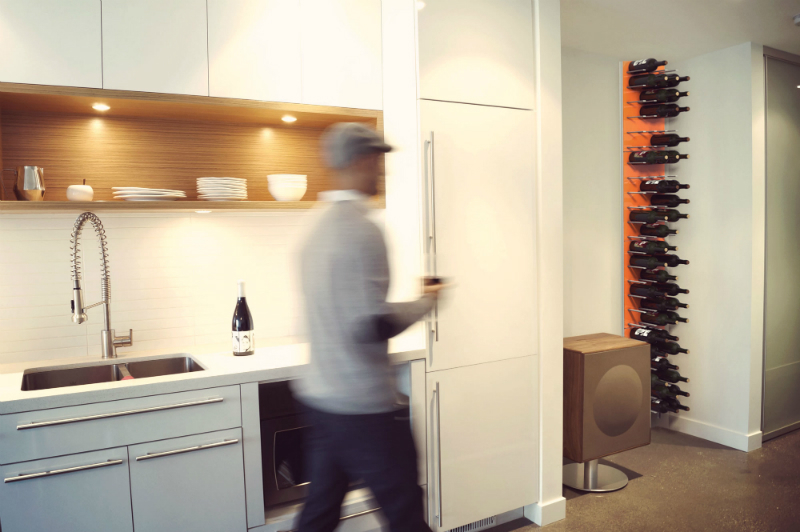 "The STACT modular wine wall system was created to be at home throughout the home, perfect for the kitchen, dining room, or heart of the cellar." Today's wine racks and storage solutions are focal points in a room, and can often feel out of place. STACT takes a minimalist approach, letting the bottles take centre stage. Each bottle sits suspended horizontally in its own space, comfortably cradled by two precision-machined extrusions. There's beauty in the flexibility of STACT; mount a single panel, create a custom pattern and plan, or grow the system as the wine collection evolves. "STACT's mission is to provide wine lovers who appreciate good design, with wine storage solutions that are smart, simple, and stunning," said Kasza. "Wine, design and eCommerce are my passions. Knowing the online wine market is expected to grow by 63 per cent to $6.5B* in sales, even projected to surpass the digital music download business this year, I believe STACT is in an exceptional position to provide customers with superior form and function when it comes to storing and displaying their bottles." The STACT modular wine wall system officially launches globally through Kickstarter, the project-driven, crowd-funding website that raises capital to help entrepreneurs offset operating costs, bringing products - and dreams - to the market faster than otherwise possible. Through STACT's Kickstarter project, customers today have the opportunity to take advantage of exclusive limited-time discounts of up to 40 per cent off the retail price. Shipping is available worldwide. The STACT modular wine wall system suggested retail price is $129.99 each. The product will be available at leading design retail stores across North America beginning Fall 2012. For more information or to view the STACT modular wine wall display collection, visit www.getSTACT.com. Established in 2011 in Vancouver, BC, Canada, STACT is based on passions for both wine and design. STACT products are designed by world-renowned designers with modern aesthetics in mind and crafted with high-quality materials. The resulting products are uniquely versatile, space efficient and customizable to fit any space, physically and through décor. For more information, visit www.getSTACT.com. To view the video associated with this release, please visit: http://www.youtube.com/watch?v=55fjQRKN6mQ. Transform your wine collection into an elegant showpiece. STACT fits any space or decor.